Every summer, Columbus has a growing list of new events for the city to try on. 2019 is no different and one in particular caught my eye called SoFest. Something about their mind-bending artwork and self-description as a “collective community experience” got me curious. Turns out, the festival is the brainchild of two senior CCAD students, Anna-Grace Blackburn & Reed Costello. It’s also their Senior thesis project. Their aim? To create a new arts festival that focuses on local creative talent and highlights an area that’s already a hub for creativity. 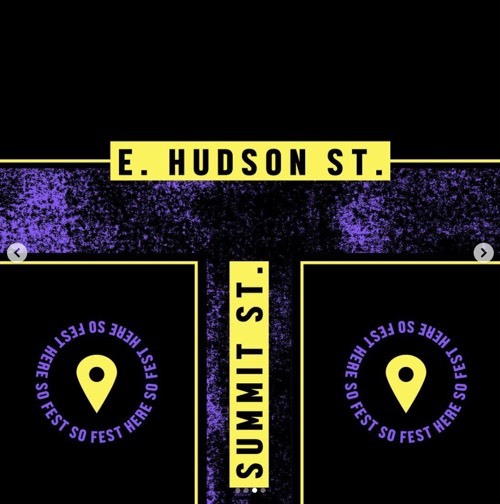 SoFest is named after the neighborhood that will host it, SoHud (South of Hudson) and will be held on Summit St., between Hudson St. and Tompkins St. The block is jam-packed with creative businesses like Studio 614, Evolve Body Art and Used Kids Records. Both Blackburn and Costello were quick to say they are big fans of the already thriving creative district and they hope to put a spotlight on all that’s already awesome about it with their fest. On May 4th, the small strip will turn into a daytime party with a line-up of bands, sidewalk vendors, food trucks and interactive installations and most of the businesses will be participating. Some will be open for the public to check out while others will be having events within the festival, like Wild Goose Creative, which will be hosting the Pinch Flat poster party during the fest. I am personally excited that Capital City Scooters is allowing people to give their Scooters a spin during the event! They chose the location of the festival intentionally. Both have been members of the neighborhood for a few years and frequent the business they are partnering with. The event was designed to have a block party type feel, one that’s not focused on technology but focused on connection. Their hope is that their neighbors and people from around the city can connect with one another while listening to music together, meeting local makers and discovering something new to love about the SoHud district. The festival will be held on May 4th, from 12 pm to 5 pm is completely free to attend for all and family friendly. You can stay connected to the festival by following them on Instagram at @SoFest614 and RSVP to this year’s event here on Facebook. The two will also be highlighting their work on the Festival at CCAD’s Chroma: Best of CCAD on May 9th. You can get more information on that event here.